If you want to find the woman in the best shape in the world, look no further than Quebec. 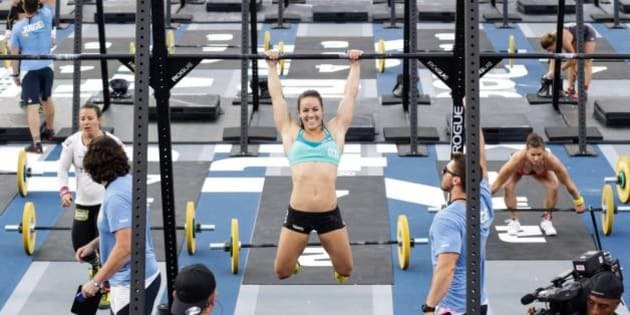 On Monday, Reebok declared the winner of its "Fittest Woman On Earth" title, and Camille Leblanc-Bazinet, a 25-year-old student originally from Richelieu, Que., who now lives in Montreal, was the champion. The Reebok Games challenges proponents of CrossFit workouts to a series of exercises they aren't prepped for in advance. This year, those included a 1,000-metre swim, overhead squats, handstand walks and rope climbs, and many other exercises that pushed athletes to demonstrate their functional movements. CrossFit is literally a family affair for the Leblanc-Bazinets. Camille started doing it with her twin sister, Rachel, while their older sister, Claude, and younger brother, Alexis, compete as well. Even their mom, Danielle Leblanc, does CrossFit, so it's not hard to see where the influence comes from. And yes, they do have their own gym, run by their father. As sister Claude explained in an interview at the 2011 games, they told their mom the best way the family could spend time together was by working out together — so everyone joined in. For Camille, who says she works out at least twice a day three times a week on her CrossFit games profile, she sticks to that form of exercise almost exclusively, "because it involves already pretty much everything," she told Hardbody News. A twin sister, a love for social media, an incredibly down-to-earth attitude and a ranking with the best of the world? There must be something in the water for Quebec athletes these days.